← Host Our YouTube Playlist! Every year the Friends of McNab’s Island Society holds a cleanup. Okay, let’s back track just a little. For those of you who are not Haligonians, McNab’s Island is a big island sitting at the mouth of our harbour. It is also a provincial park. Last but not least, it’s really a cool spot with two forts and a lighthouse. Anyway, as I was saying, every year there is a cleanup, and this year Sarah and I decided we wanted to take the Guides over for the day. With the rains holding off, we boarded a boat with 200 other people and headed over to clean up. For the record, I’d only been back from my European vacation for a few days at this point. Yes, I’m just that crazy, and enjoy being around my Guides just that much! Over the course of the day, more than 400 bags of garbage were cleared as well as several other finds. I heard of an industrial vacuum cleaner being found! 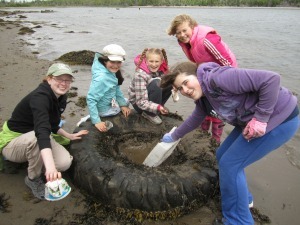 Even our girls ended up with some interesting finds – we found a sleeping bag filled with sand, a tire from a tug boat and a portion of a canine skull! We cleaned one of the beaches by Wreck Cove for about two hours and took a well deserved/earned lunch break – for the record, wow, almond butter and jam sandwiches have NEVER tasted so good before. Then we headed off to explore one of the two forts. I think we spent another 90 minutes at the fort and boy did the girls have fun . . . in and out of everything, playing make-believe, and just running around. By the time we loaded back on the boat to return to Halifax everyone was tired but happy. So tired that one of our girls fell asleep three times on the boat! All in all, I’d say that it was a successful and fun trip. I can’t wait to take the girls again next year! To read more by Kirsten, visit her blog: Kirsten’s Life. This entry was posted in Awesome Activities and tagged clean up, eco citizens. Bookmark the permalink.